Valley Church maintains and operates a local CHOW pantry to help meet the emergency food needs of people living in the Chenango and Chenango Forks areas. 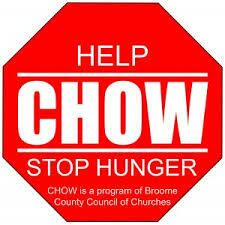 Our pantry is part of the Broome County Council of Churches CHOW network. If you or someone you know is in need of emergency food assistance, please call First Call For Help by dialing 2-1-1 from a landline phone or call 1-800-901-2180. For more information about CHOW, please see here.